The United States Capitol is the building of the U.S. Congress and the legislature of the U.S. federal government. 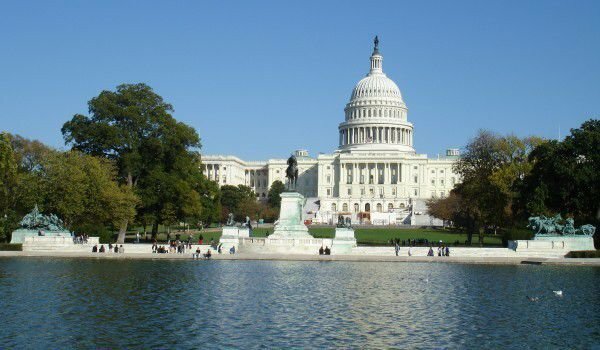 The grand and white facade of the Capitol is located in the U.S. capital Washington, like standing on top of Capitol Hill, named from the Roman Capitol Hill, which was the political center of Rome. Beautiful building extend to 16.5 acres, as the east and west ends are called fronts. Historically, only the east was designed to meet visitors and officials. Architect of the original construction of the United States Capitol is the William Thornton, who won the competition for the project. The young architect was inspired by the eastern front of the Louvre in Paris, a central architect borrowed from the Paris Pantheon. Original design of the Capitol later modified by Benjamin Henry Latrobe, and subsequently by Charles Bulfinch. The dome of the Capitol , and the wings were designed by German immigrants Walter Thomas (Thomas U. Walter) and August Schoenborn, and were consequently implemented under the supervision of Edward Clark. The foundation stone of United States Capitol in Washington was requested by President George Washington on September 18, 1793. Capitol Hill became the home of the official inauguration of U.S. Presidents. First Ceremony of giving the title to the president here, was decided on March 4, 1801, when here the mandate was handed to Thomas Jefferson. United States Congress and its predecessors had met previously in Philadelphia, in New York, and many other places. After the burning of the Capitol Hill during the British-American War in 1814, the building was rebuilt, by adding two additional wings. After the great fire occurred, a dome with a statue of Columbia, which is a symbol of America, was added. In the years Capitol Hill serves as an example for the rest of America, which began to build separate Capitols. A major expansion of the United States Capitol was undertaken in the middle of last century. Removed, were the original Corinthian columns. On December 19, 1960 Capitol was declared a National Historic Monument and is today one of the favorite architectural structures of America. Although in the building of the Capitol are placed legislative bodies of the United States, inside the building organized tourist visits are possible. During the tour visitors are able to see the incredibly beautiful rotunda hall with the statues, the original hall of the Supreme Court, and the Crypt, which was to be burial ground of George Washington and his wife Martha. The building of the Capitol is the state-made pilgrimage to the remains of the following U.S. presidents: Abraham Lincoln, James Garfield, William McKinley, Warren Harding, John Kennedy, Herbert Hoover, Dwight Eisenhower, Lyndon Johnson, Ronald Reagan and Gerald Ford. In front of the Capitol can be seen a monument to George Washington, who impresses with his performance and size. The granite building on Capitol Hill is 169 meters high and has a whole 893 feet width. Using the elevator to reach the very top of the building, one finds it boasting beautiful views of all parts of the U.S. capital Washington.